The smartphone sensing blocks are the most numerous in Robobo. All of them are related to information that Robobo can capture through the sensors located in the smartphone, and therefore, are those that provide the robot with a greater potential. It is important to use the monitoring window to check the values returned by these sensors in real time in each specific environment. 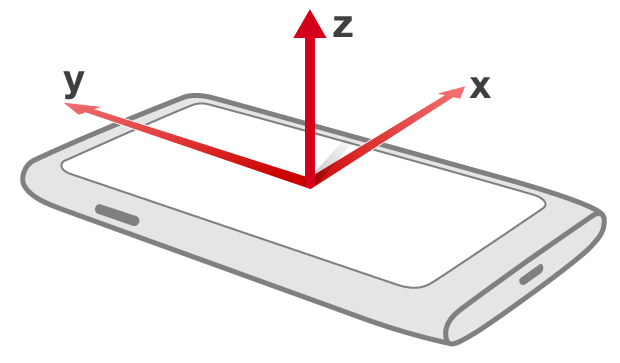 FUNCTION: Returns the area of the smartphone screen on which a brief press has been made (tap). 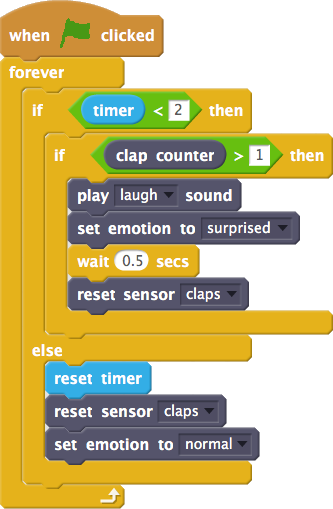 This block only detects simple pulsations, that is, if we briefly press the screen twice, it will return two values. RANGE: Returns one of the following five values: forehead, eye, right, left, mouth or chin, depending on the area of the screen on which the pulsation is made. The following diagram shows, approximately, the zones corresponding to the values returned. WARNING: This sensor maintains the last measured value. 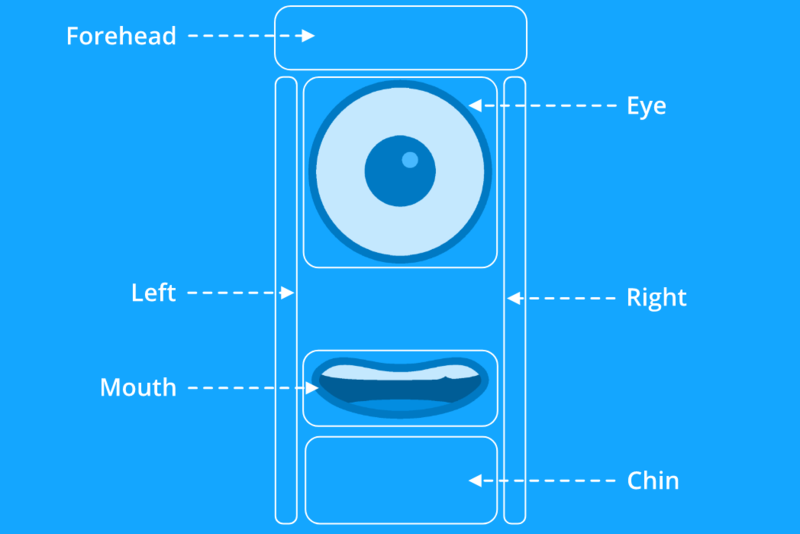 The following program makes Robobo show “anger” if you put your finger in its eye. 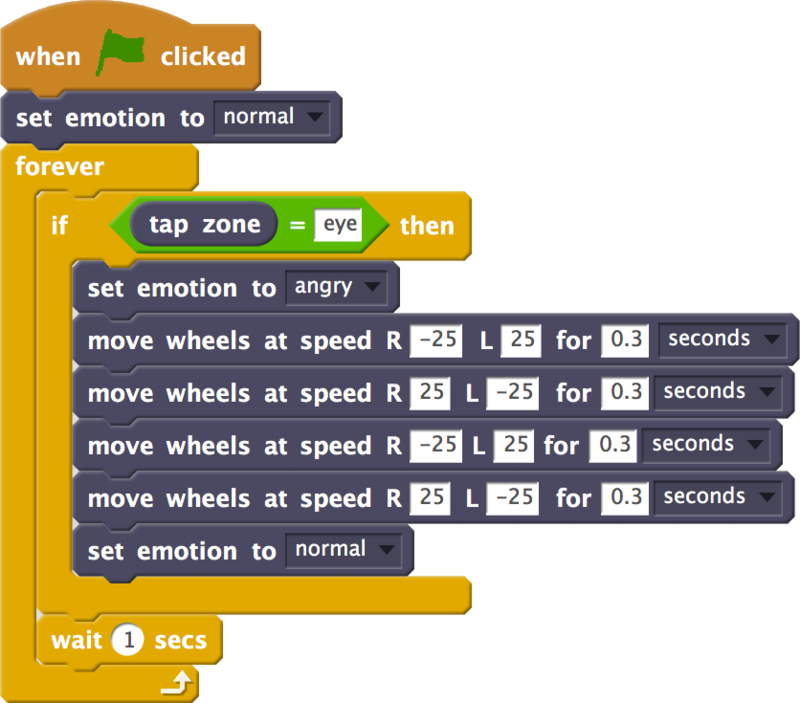 To do this, it checks if the tap zone block returns “eye”, in which case the facial expression is changed to angry, the wheels are moved from side to side and, finally, the expression returns to normal. FUNCTION: Returns the position x or y in which a brief screen pulsation (tap) is detected. Range: There are 2 possible axes to be selected, x and y, which correspond to the Cartesian coordinates shown above. FUNCTION: Returns the angle at which you slide your finger across the screen of the smartphone (fling). This angle is given by the direction of the gesture on the screen. RANK: From 0 to 360 degrees, in polar coordinates. The following images show 3 possible fling gestures that could be made on the smartphone screen, and the angle returned by this sensor. In the left image, the angle would be the same in both gestures, 180 degrees. In the central image, the angle would be about 70 degrees and, finally, in the right image the angle would be about 330 degrees. FUNCTION: Returns the ambient light level detected by the built-in sensor on the smartphone screen. WARNING: Not all smartphone models include this sensor. RANGE: Any positive integer value. The value is returned in LUX (lx), the international system unit for the lighting level. FUNCTION: Returns the last musical note detected with the microphone of the smartphone. The note is continuously measured. 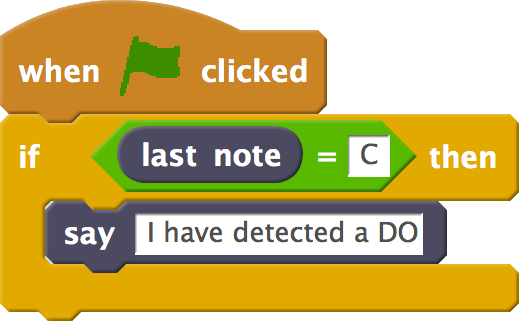 FUNCTION: It is activated when a note is detected. 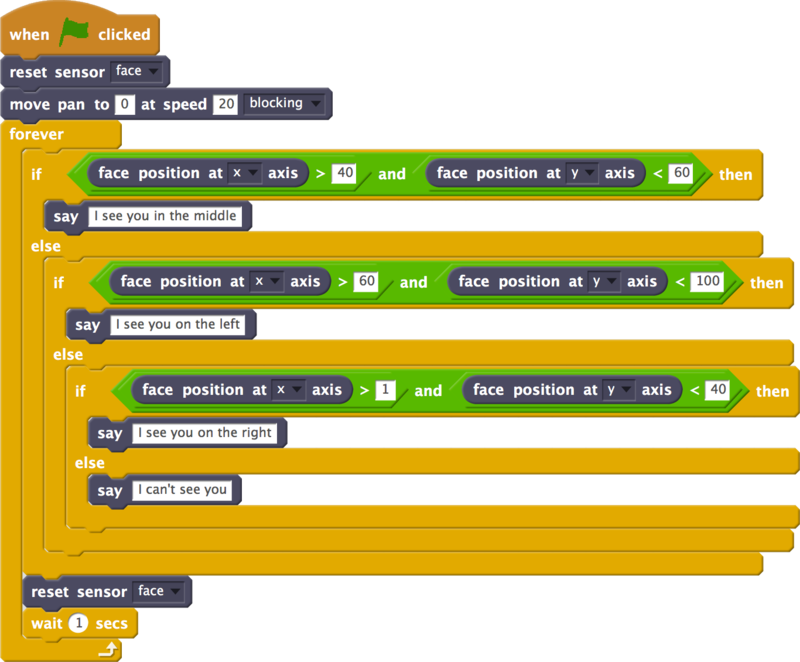 Its operation is that of any Scratch hat block, that is, if this block is activated, those that are connected to it are executed. WARNING: This block is continuously running, capturing all the sounds detected by the smartphone. Its use can slow down other blocks that use sound. 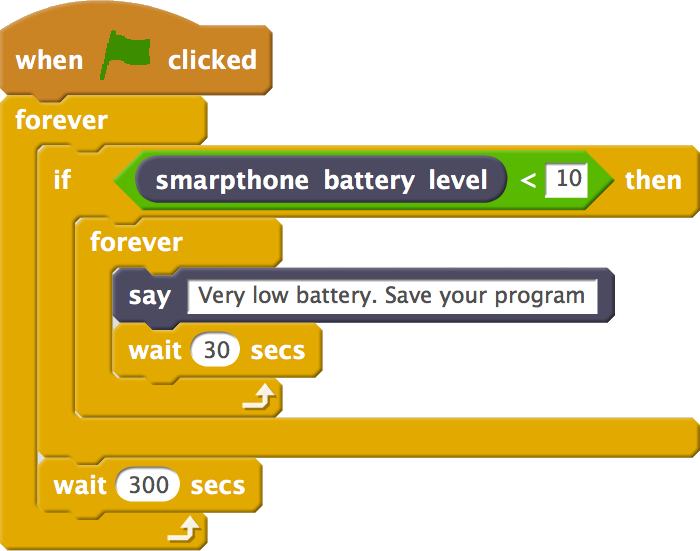 FUNCTION: Returns the number of claps detected by the smartphone’s microphone. WARNING: The block is set for the detection of clap-type sounds, but it must be taken into account that the ambient noise greatly affects the detection, being able to confuse similar noises in this sensor. On the other hand, this sensor maintains the last detected value. 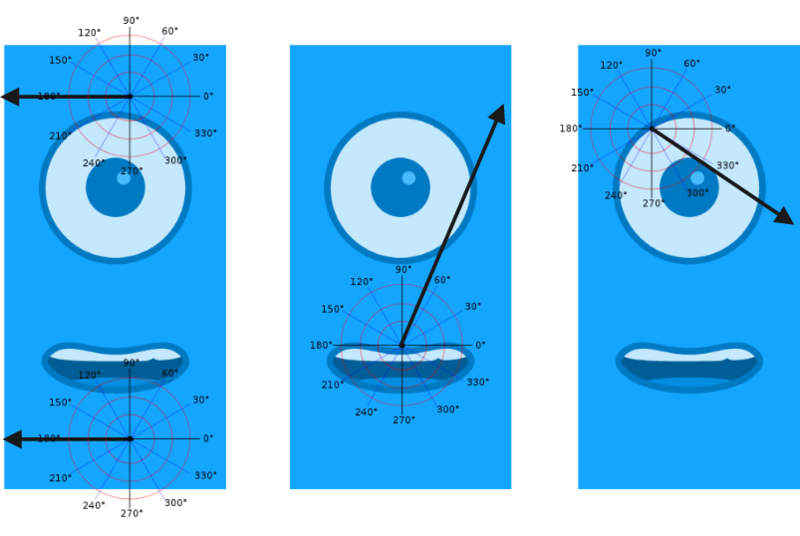 FUNCTION: Returns the distance at which the smartphone front camera detects a face. RANGE: returns only three text values: close, mid (medium) or far. WARNING: the face detection depends a lot on the ambient light level. It is recommended that the face be properly illuminated. 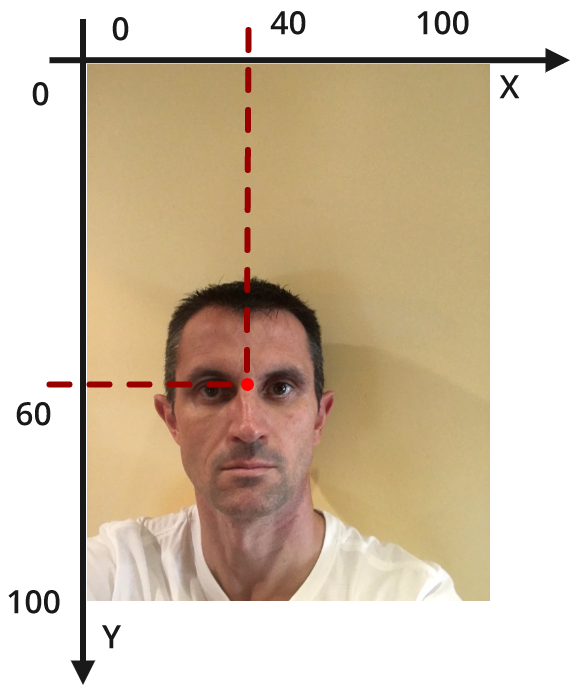 On the other hand, the precision in the face detection depends on the quality of the smartphone front camera. 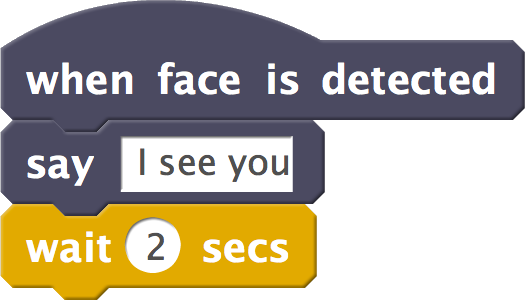 WARNING: The face detection depends a lot on the ambient light level and how it affects the face to be detected. It is recommended that the face be properly illuminated. On the other hand, the precision in the face detection depends on the quality of the smartphone front camera. This sensor stores the last detected value. FUNCTION: It is activated when a face is detected. 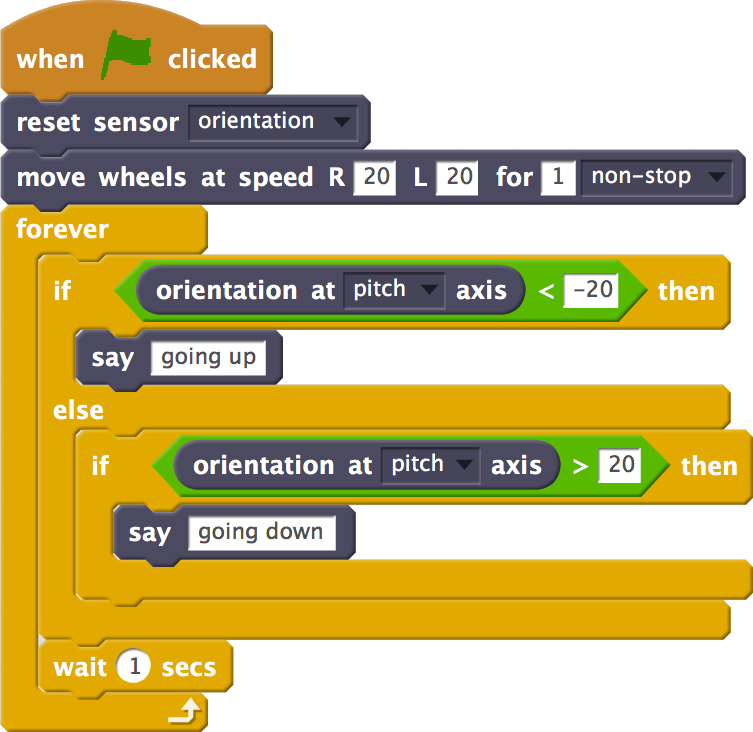 Its operation is that of any Scratch hat block, that is, if this block is activated, those that are connected to it are executed. WARNING: This block is continuously running, continuously capturing the presence of a face. Its use can slow down other blocks that use face detection. FUNCTION: It is activated when a face is no longer detected. 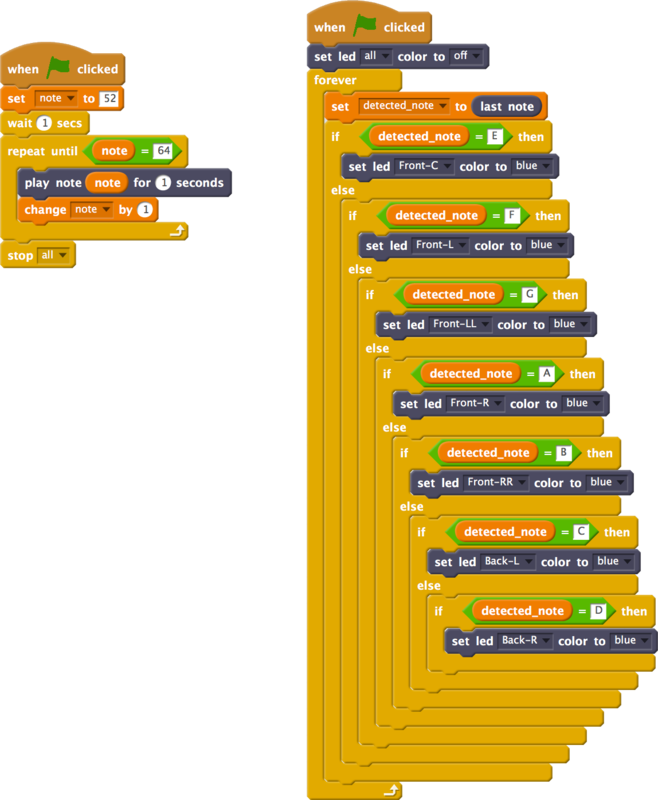 Its operation is that of any Scratch hat block, that is, if this block is activated, those that are connected to it are executed. WARNING: This block is continuously running, continuously capturing the non-presence of a face. Its use can slow down other blocks that use face detection. FUNCTION: Returns the area, of the color selected in the drop-down field, that is detected in the image of the smartphone front camera. WARNING: The detection of the area of a certain color depends very much on the ambient light level and how it affects the object to be detected. It is recommended that the object be properly illuminated. On the other hand, the accuracy in color detection depends on the quality of the smartphone front camera. CALIBRATED: For optimal operation of this block, it is recommended to perform the camera calibration process described in app user guide. During calibration you can also select the custom color. RANK: The returned area can have any positive integer value and it is measured in pixels. COLOR SELECTION: The area returned by this sensor will be that of the color selected in this field. If there is more than one zone of the same color in the image, the area of the largest one will be returned, but not the sum of all of them. Range: The possible colors to detect are red, green, blue and custom. By default, the only color detected is green. 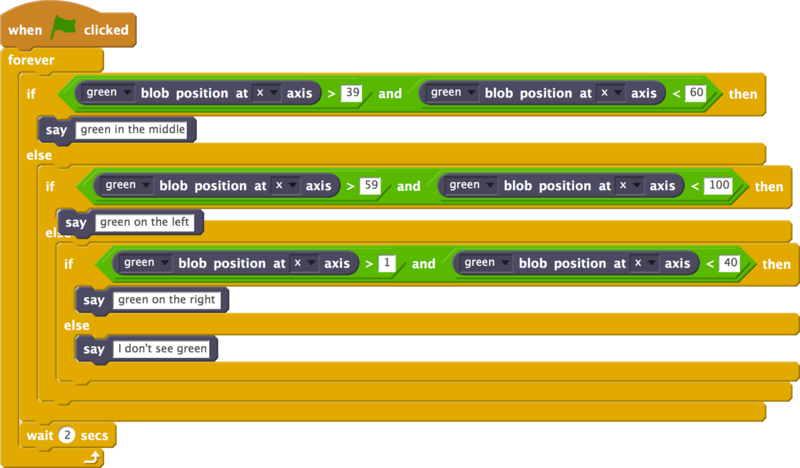 To detect other colors, they must be previously activated in the block configure blob detection colors. 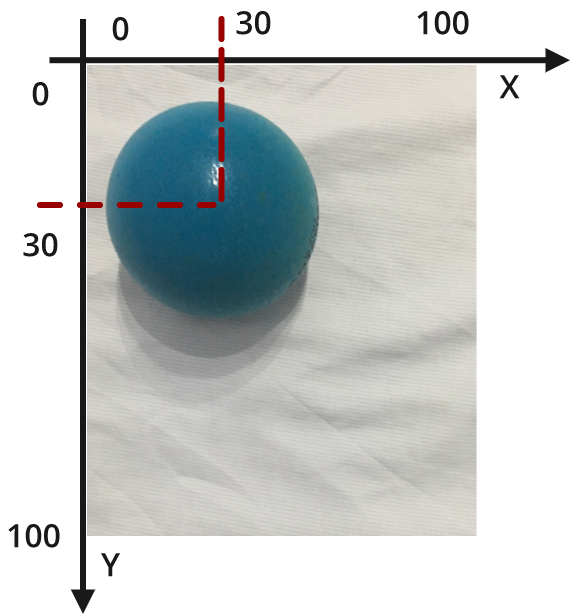 FUNCTION: Returns the x or y coordinate of the center of the color area selected in the drop-down field detected by the front smartphone camera. WARNING: The detection of the area of a certain color depends very much on the ambient light level and how it affects the object to be detected. It is recommended that the object be properly illuminated. On the other hand, the accuracy in color detection depends on the quality of the front camera of the smartphone. CALIBRATED: For optimal operation of this block, it is recommended to perform the calibration process of the camera described in app user guide. During calibration you can also select what is the custom color. 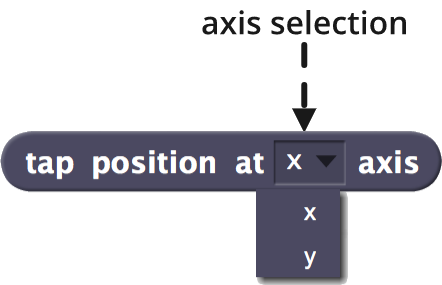 The value x or y returned by this sensor corresponds to the center of the area of the color area selected in this field. If there is more than one area of the same color in the image, the x or y of the largest one will be returned. Range: The possible colors to detect are red, green, blue and custom. By default, the only color detected is green. 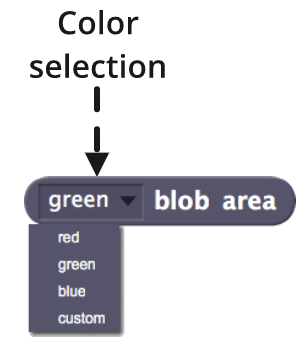 To detect other colors, they must be previously activated in the configure blob detection colors block. Range: The possible values are x or y, according to the Cartesian coordinates shown in the previous image. 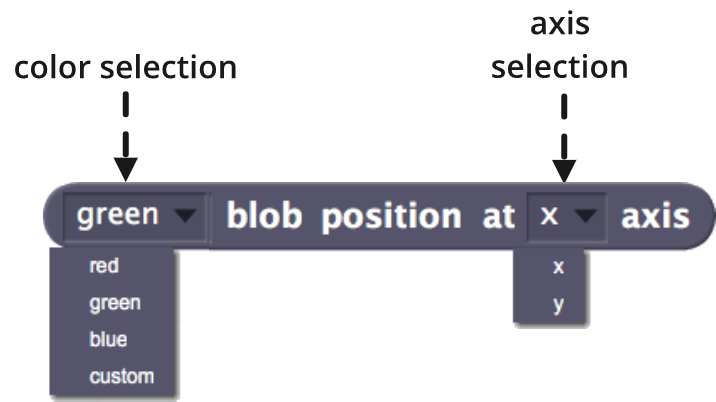 FUNCTION: It allows you to select which colors will be detected in the read _ area and read _ blob position at _ axis blocks, using the red, green, blue or custom color activation selection fields. The color detection consumes a lot of smartphone resources, because it is analyzing the camera image continuously, which requires an important use of the processor that can slow down Robobo operation. WARNING: This block affects the program in which it is used, and only while it is running. By default, the only color detected is green. CALIBRATED: For optimal operation of the blocks that use color detection with the camera, it is recommended to perform the calibration process from the smartphone app, described in the app user guide. During calibration you can also select the custom color. 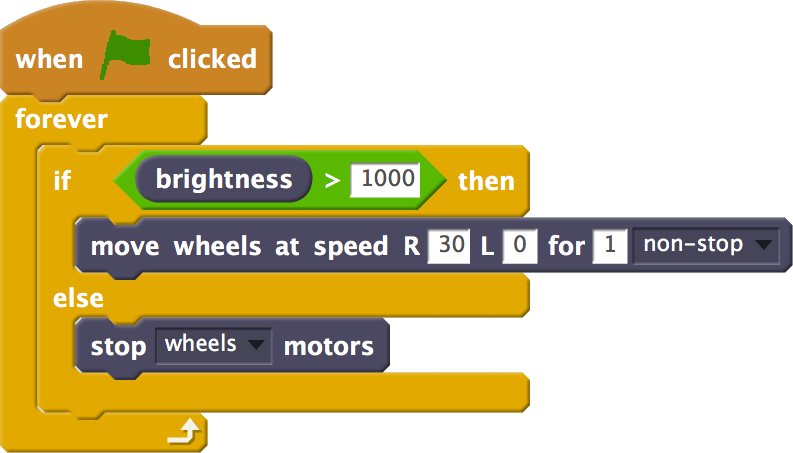 Range: There are two possible values, true or false, which indicate respectively if the program in which this block is used should detect the red color or not. 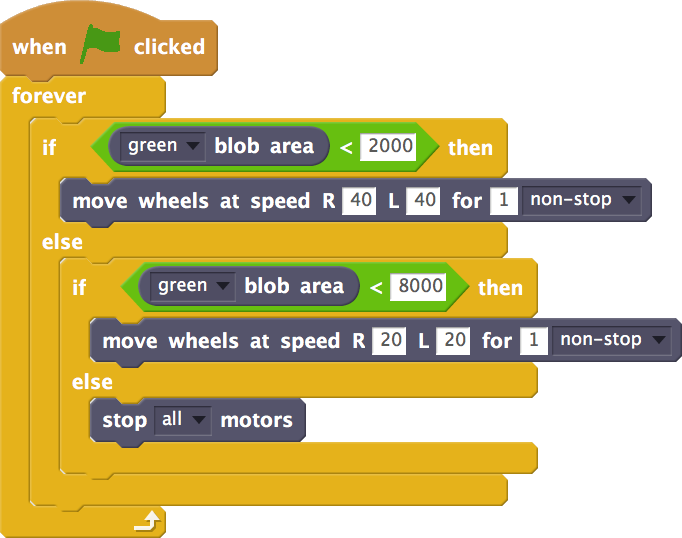 Range: There are two possible values, true or false, which indicate respectively if the program in which this block is used should detect the green color or not. 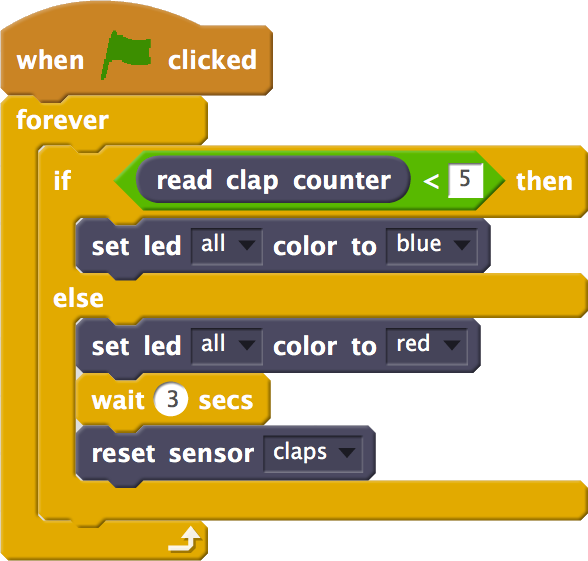 Range: There are two possible values, true or false, which indicate respectively if the program in which this block is used should detect the blue color or not. 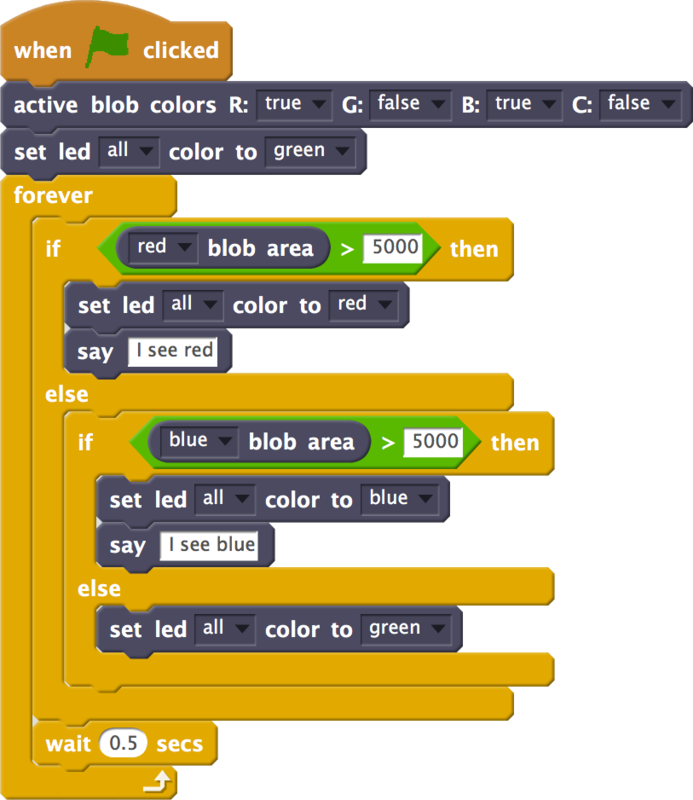 Range: There are two possible values, true or false, which indicate respectively if the program in which this block is used should detect the custom color or not. 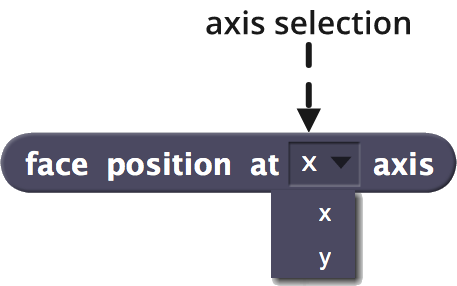 FUNCTION: Returns the smartphone orientation according to the navigation angle chosen in the drop-down selection field. As the smartphone is fixed to the base through the holder, this orientation is that of Robobo itself. WARNING: Not all smartphones have an orientation sensor (gyroscope). 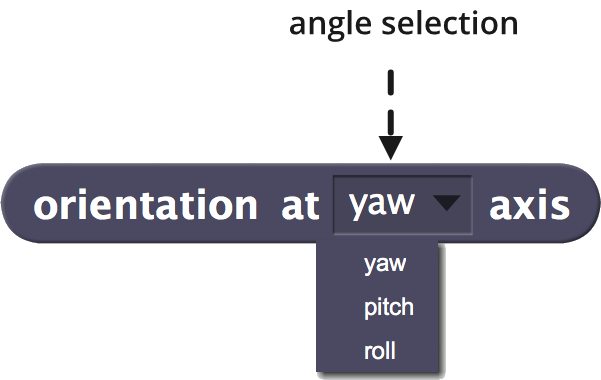 Range: There are 3 possible navigation angles: yaw, pitch and roll. 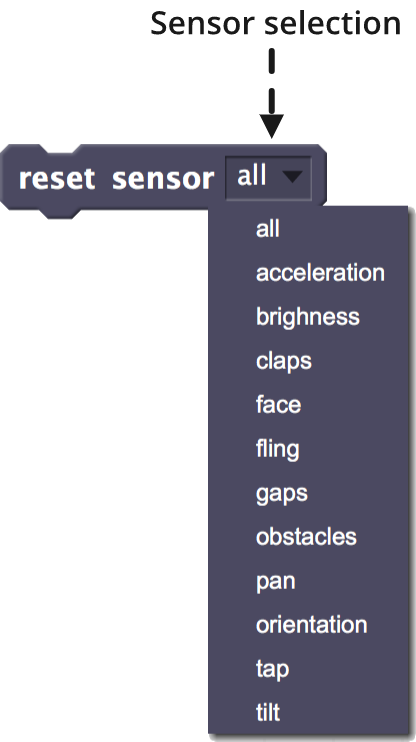 FUNCTION: Restarts the sensor value indicated in the sensor selection field. 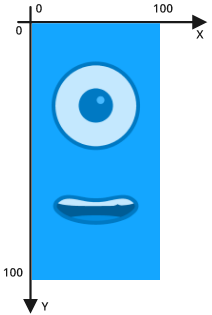 This block also affects the Robobo base sensors, so its description also appears in that section. 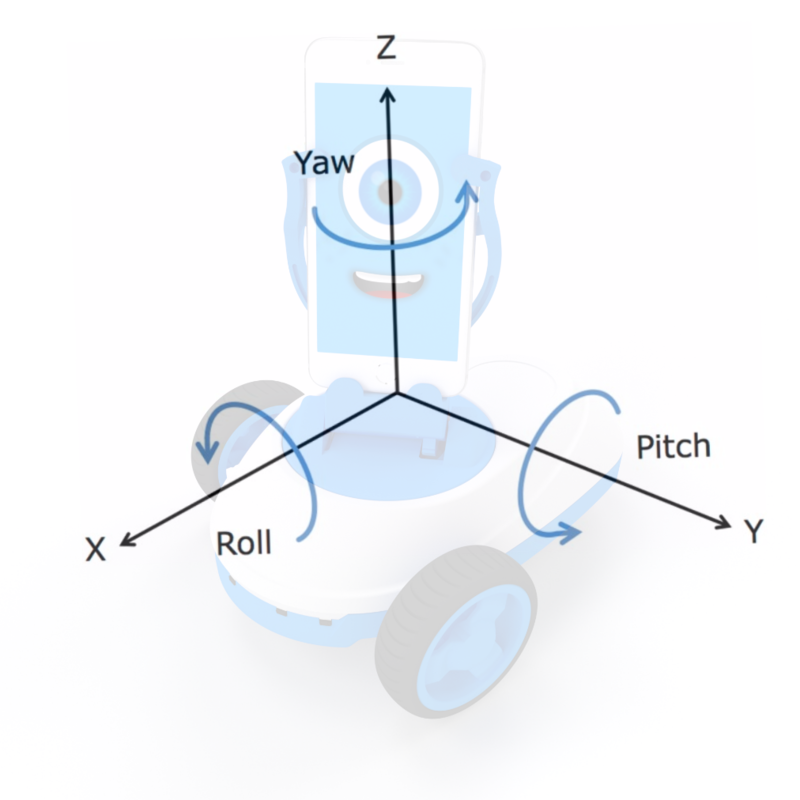 acceleration: Restarts the value of the accelerometer to 0 on the three axes (x, y, z). brightness: Resets the value of the ambient light sensor to 0.
face: Resets the face distance sensor to 0 and the face position sensor (x, y) to (0,0). 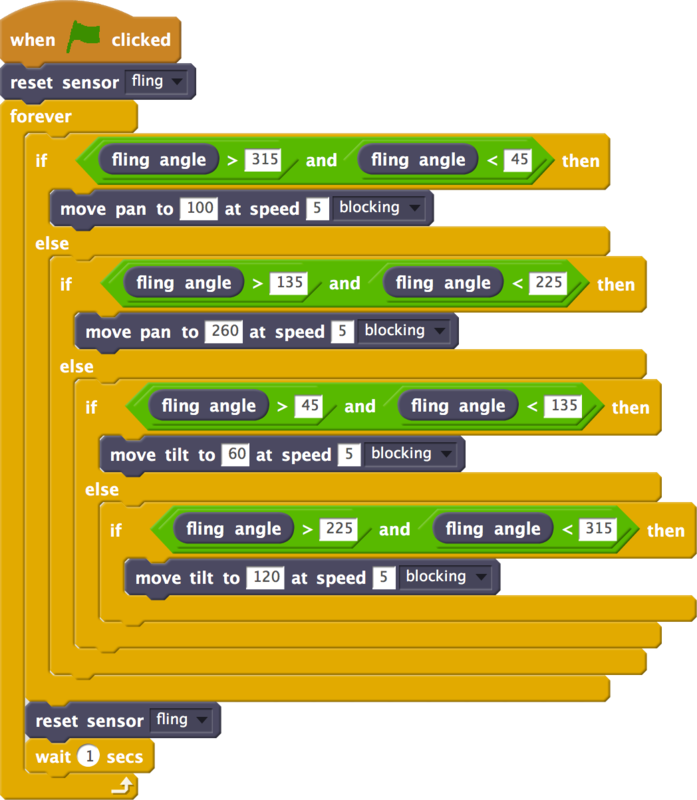 fling: Restarts the fling angle sensor on the screen to 0.
orientation: Restarts the smartphone’s orientation angles (yaw, pitch, roll) to 0.
tap: Restarts the tap sensor on the screen to NONE. FUNCTION: Returns the smartphone battery level. Range: From 0 to 100, so that the higher the value, the higher the battery level. 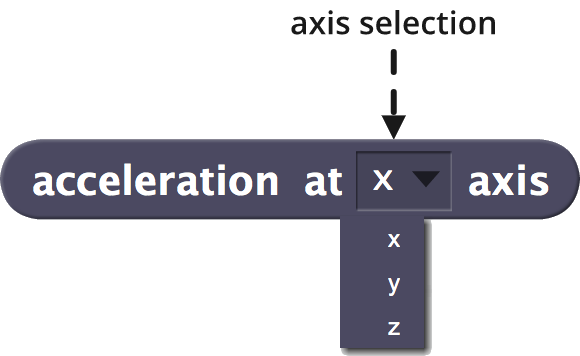 FUNCTION: Returns the acceleration suffered by the smartphone on the axis chosen in the axis selection drop-down field. As the smartphone is fixed to the base through the holder, this acceleration is that of Robobo itself. Range: You can select the 3 axes x, y, z of the Cartesian system.